And so it came to pass that Holmes and I embarked on a grand tour of America. My friend’s intuition had proven to be correct, and we became involved in a number of high-profile cases which attracted public notice. Holmes successfully solved the case of the kidnapped Virginia twins, Fannie Mae and Freddie Mac. In Kentucky he managed to locate a famous sporting trophy which had been missing for nine years. And in New York he was involved in the strange affair of the vanishing banks, the details of which I swore solemn oaths, at Holmes’ insistence, to leave out of my memoirs until sufficient time had passed. After these adventures, Holmes and I eventually found ourselves at the Mayflower Hotel in Washington, D.C. Holmes was never much of a tourist; while his criminal investigations had taken him far and wide in Europe, so single-minded was my friend in pursuing the solution to a crime and the apprehension of its perpetrator that he never paused to take in the sights, wherever his travels took him. Thus it was with the greatest reluctance that he allowed me to drag him to see the various monuments and memorials in America’s capital. So it was with great relief that Holmes received the concierge of the Mayflower as we took tea in the salon of the hotel. “Mr. 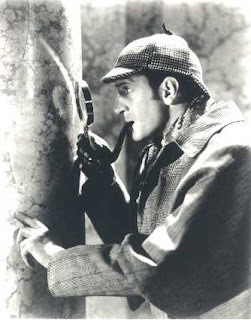 Holmes,” the fellow said after stealthily approaching us, “may I have a private word? It is of the gravest urgency.” He threw me a furtive glance, which I took as an invitation to depart, and so rose from my chair.